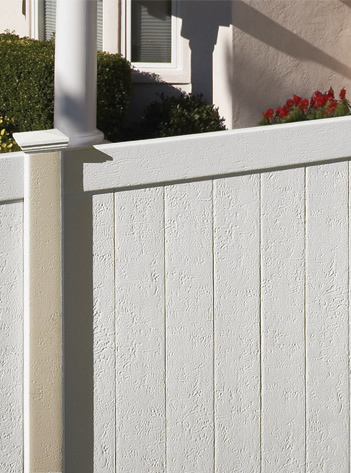 WE OFFER THE LOWEST PRICE ON ALL BUFFTECH VINYL FENCE AVAILABLE! Now offering 10% off all bufftech orders over $1000! 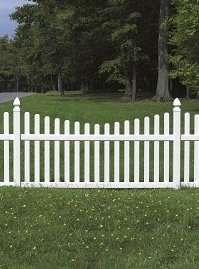 With Bufftech vinyl fence, you can have that house in the suburbs with a white picket fence without ever having to worry about staining or treating the fence or the color fading. Cape Cod, Yorkshire, Rothbury, and Danbury are all available in straight pickets and concave styles. Danbury even comes in an exclusive cedar color. 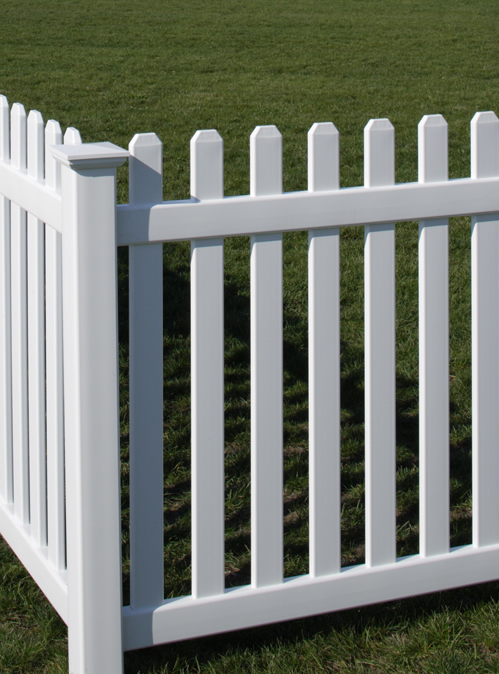 Get the look of a wood picket fence without the hassle. 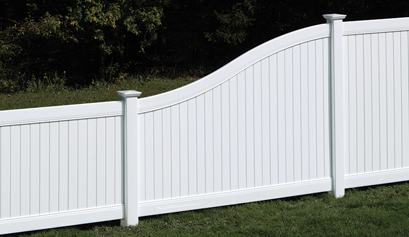 Canterbury, Canterbury Swoop, Manchester, and Manchester Concave fences offer the classical look of picket fences with easy installation. Don't waste hours installing fence sections and maintaining materials like wood or worrying about termites. Bufftech vinyl fence will never chip or fade and come with a limited lifetime warranty. Order yours today! For a sleeker, more modern appearance, consider Bufftech contemporary fence. 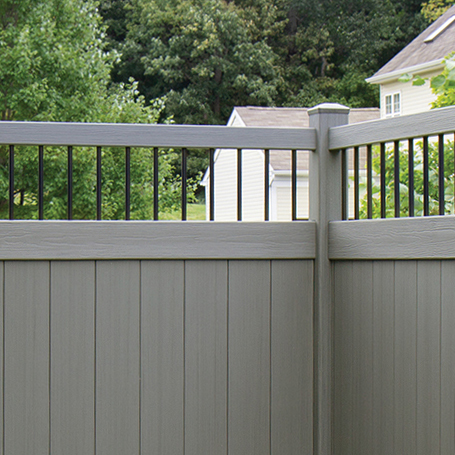 Designed to appeal to every aesthetic, contemporary vinyl fence is perfect for pets and children. Several designs are approved for use as pool fences. Baron, Countess, Monarch, Princeton, and Victorian styles are available with and without midrails. Baron can even be purchased in Select Cedar for a wood texture. With semi-private fence by Bufftech, you don't have to choose between privacy and style. This line of vinyl fencing is a beautiful addition to your business or home without letting nosy neighbors inside. Alternating slats allow you to glance through the fence without the world peering back in. 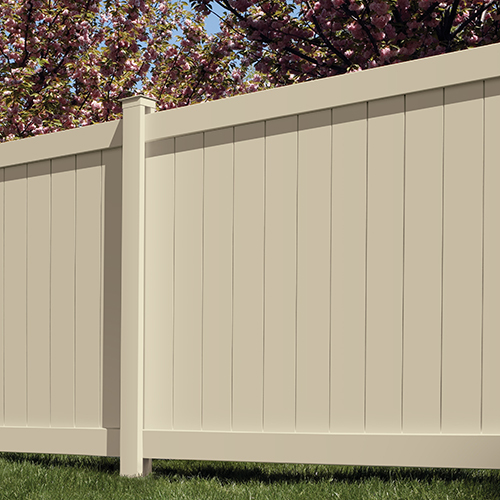 Bufftech semi-private vinyl fence is available in Columbia, Columbia with Lattice, Imperial, Imperial with a midrail, Imperial with cedar texturing, and Millbrook. As vinyl fencing replaced wood, there was bound to be a demand for privacy fences. Add style and class to your yard or business while retaining a quiet, private atmosphere. Bufftech offers privacy style vinyl fences in Brookline, Chesterfield, New Lexington, and Galveston designs. Several feature Lattice and Victorian accents as additions for the top of the fence. Chesterfield is even available in 'S' curve and swoop styles or with a stucco texture. Bufftech also produces several full panel privacy fences in CertaGrain wood textures, including Arbor, Arctic, Natural Clay, Sierra, and Weathered blends. 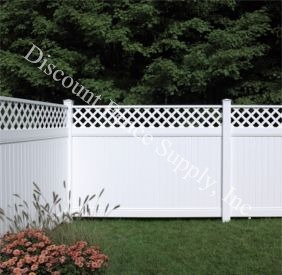 Chesterfield vinyl fence offers unrivaled privacy. Bufftech's CertaGrain texture adds a natural beauty to the look and feel of your property. 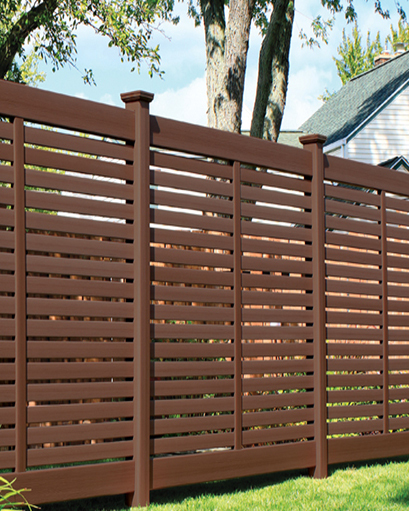 CertaGrain is the only authentic wood grain textured vinyl fence on the market and comes in 11 stunning colors. 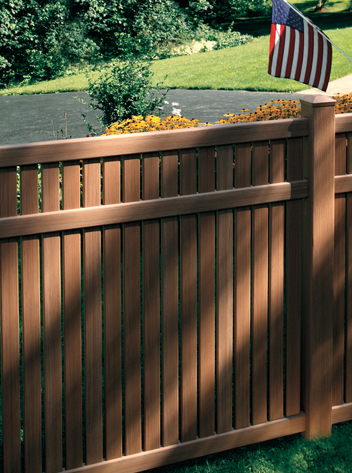 More organic hues like Sierra Blend and Honey Blend provide the beauty of a wood fence without troublesome maintenance. 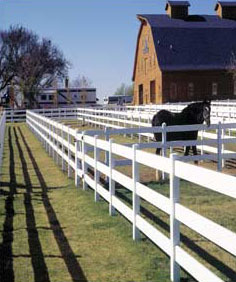 Post & Rail is the perfect solution for farm fences, housing developments, and businesses. 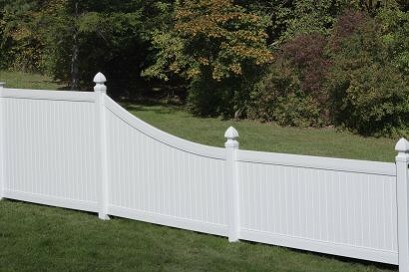 Decorative two rail fencing comes in many of the same brilliant shades offered for other CertaGrain fences as well as a smooth classic white vinyl. Select from three and four rail or cross buck for more practical applications. Unlike traditional wood fences, these Bufftech fences won't splinter or rot and are safe for your horses and other livestock, pets, and children. Like Bufftech, EverNew is another signature CertainTeed brand. 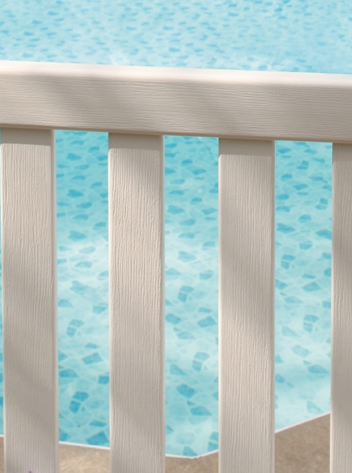 EverNew railings come five distinct designs, all engineered to look like traditional wood fences. 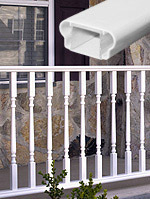 Kingston, Oxford, and Panorama rails and posts are all made to the high standard you expect from other CertainTeed vinyl products. 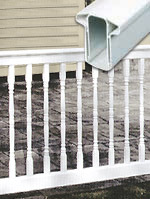 Specifically designed for additional stability, Durham rails are manufactured from aluminum. These porch posts, railing systems, and hand rails are a fantastic choice for both residential and commercial applications. Personalize your fence with New England, Ball, Gothic, Pyramid, or Horse Head vinyl post caps. Protect existing fence and porch posts with snap wrap and repair or strengthen your fence with additional hardware, including gate hinges and latches. Structural support posts by CertainTeed offer strength and a solid foundation with all the benefits of vinyl in three unique styles.